Kilpisjärvi Biological Station in Kilpisjärvi/ Lapland/ Finland. Organized by the Finnish Bioart Society in the context of the Ars Bioarctica project together with the Kilpisjärvi Biological Station. “ Field_Notes – Cultivating Grounds” is a week long field laboratory for theory and practice on art&science work at the Kilpisjärvi Biological Station of the University of Helsinki in Lapland. Five working groups, each hosted by an expert (Oron Catts, Marta de Menezes, Anu Osva, Tapio Makela and Terike Haapoja) together with a team of four, will develop, test and evaluate specific artistic approaches based on the interplay of art&science. The outcome of Field_Notes will result in a publication published by the Finnish Bioart Society in 2012. We warmly welcome artists, scientists and practitioners to participate and contribute to the development of the field. “Cultivating Ground” refers to the intention of Field_Notes to develop and strengthen art&science practice with a specific focus on the locality of Kilpisjärvi. The local nature and ecology, as well as the scientific environment and infrastructure of the Kilpisjärvi Biological Station will act as a catalyst for the field work carried out. Field work is an activity referring to the collection of raw data. Fieldwork is something what one does locally on the field and about the field. It is a form of practice which cannot be done elsewhere. However it is not opposite of theoretical work, but a crucial component of it. One could say that the fieldwork keeps one close to the research topic. A very similar type of practice is inherent in the arts. This is specifically apparent with art forms that aim at creating awareness, mobilizing the public, and working locally with people in their environment. In these kinds of practices the artistic research, production and implementation are happening in the field, close to the topics and to the public the artist wants to reach. Practitioners, in both art and science, repeatedly argue that their disciplines loose touch with the actual research subject or topic while the focus is directed on lab work or gallery presentation. Field_Notes aims to investigate and point out the importance of field work in art&science. The fields where Field_Notes will be carried out specifically are the subarctic nature, ecology and landscape, the lab, the workshop, the study, the infosphere and the Field_Notes working groups as such. an important role in biological processes such as cell differentiation and development. Some argue that the Extracellular matrix (ECM) and the milieu are more significant than DNA in the development and processes of complex organisms. This is a major shift from the reductionist privileging of the database (the genome) towards a more complex application of context as a major driver in engaging with our understanding of life. We will collect materials form Kilpisjärvi and to try and transform them into different types of substrates/biomaterials for tissue growth, as an opening for a broader exploration concerning the cultural importance of the biological milieu. The Body/Nature connection refers to nature as a body, something akin to an organism, but also to the body, our body as a sensor, part of nature and immersed in it: an interface with the rest of nature connecting us, linking us and transforming our relation to it. This relation, this communication is part of what defines us as humans, as animals and as natural. This group will try to explore the possibilities of manipulating life, nature and our own nature to express awareness and concepts close to the idea of nature's identity and our own in present times. 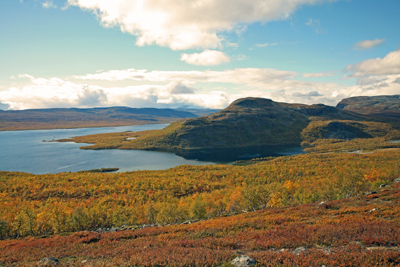 Kilpisjärvi is an important site for research on Arctic freshwater ecosystems. During the last few years also Finnish artists have been involved with water ecosystem research in Kilpisjärvi, with a focus on phytoplankton and water fleas. The group will focus on the topic of Arctic waters through artistic, anthropological, ecological, philosophical, geophysical and other relevant tools. It will also reflect and process previously collected raw data, experiences and workshop methodologies achieved during the Arctic Waters workshop held earlier this summer. Special attention will be given to collaborative artist and scientist lead field work in nature. - in the workshop, sub-Arctic nature and amongst data sets. Politics and affect of environmental computing looks at how researchers and artists work with environmental data in the field and how it is post produced to info graphics as well as into affective interfaces. What kind of a sense and sensibility informs the data gatherer that connects the information with a living environment? How can such contextual and tacit experience be carried over alongside with the data? Artists, activists and researchers are invited to bring along different kits for sensing environmental data, yet more importantly, to engage in a field and file note-taking experience of writing a mind map around how to make data something to be felt. Is there perhaps a way in which affect of environmental data may also become more political, an agent for change? The laboratory life group does research on all the other groups. The group will disguise itself in the form of anthropologists in order to look at how art&science projects on the field are created. The aim is to critically look at the methods and practices of the field and to see whether there are ethical or aesthetic questions specific to local practices. The group uses the tools of ecocritisism, philosophy of science, art history, interviews and documentation. We are looking for 20 artists, scientists and practitioners, which are interested to develop, collaborate and work in one of the groups. Deadline is the 30th of June 2011. For the chosen collaborators Field_Notes will take care about the expenses for a journey from Helsinki to Kilpisjärvi and back, as well as full board and accommodation at the Kilpisjärvi Biological Station. yhteistyössä Kilpisjärven Biologisen aseman kanssa. materiaalista julkaisun vuoden 2012 aikana. tapahtumaan ja kehittämään kentän toimintaa. Tämän kenttälaboratorion yhteydessä käsite Fieldwork, "kenttätyö"
the cultural importance of the biological milieu. artist and scientist lead field work in nature. environmental data may also become more political, an agent for change? science, art history, interviews and documentation. ideoita. Kenttätyön kielinä ovat suomi ja englanti. tekemään yhteistyötä osallistuen ryhmiin muiden ammattilaisten kanssa. takaisin sekä majoituksen ja ateriat.